**This ebook contains a bonus prologue! This was a fun, well-written book. Resigned to spinsterhood, Millicent joins the Everton Domestic Society and is assigned to find a match for Preston, a duke. Preston has been rejected by two fiancees and is not in a hurry to be matched with another. They try to resist the attraction they feel to each other. I enjoyed this book and look forward to reading more books by this author. WOW… What a terrific read!! A Lady's Escape by A.S Fenichel is book 2 Everton Domestic Society series. I am fairly new to A.S. Fenichel’s books but I am becoming a fast fan! Though in a series this book can be read as a standalone. This is a charming and wonderful read and her lovable characters are a true delight. Her description paint such a clear picture of what is happening that it gives you that true regency feel. This story has matchmaking, death, understanding, trust, being lower in station, chess, persuasion, a loving mother & uncle, an explosion, injury and love at first sight. Can a Duke really fall in love with a working class lady? You will just have to read this story to find out. I highly recommend this book! ***This book was gifted to me and I am voluntarily reviewing. I have read a number of books in this series and A Lady's Escape did not disappoint me. When Millicent is introduced to the Duke of Middleton, she discovers that her vow to remain unmarried becomes more and more difficult to uphold. Preston, on the other hand, is intrigued by the woman who has been tasked with finding him a wife, and before long he finds that the ladies she introduces him to are not nearly as interesting as Millie herself. The romance in the story builds slowly but is undeniable. As Millie tries ever so hard to stick to the Everton Ladies Handbook, her resolve crumbles with every touch and glance from Preston. 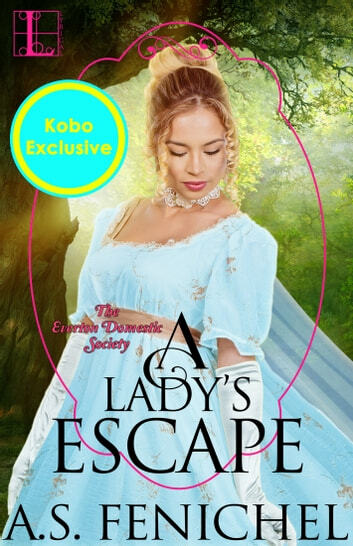 The reader is carried along in this well-written Regency romance and although there is some adventure, the story is of the development of the relationship between the Everton Lady, Millicent Edgebrook and His Grace the Duke of Middleton. This novel is part of a series and characters from previous books in the series appear in this one too, however it is nevertheless a standalone and comes to a happy conclusion. I received a copy of this book through NetGalley and this is my honest and voluntary review. Millicent Edgebrook has had plenty of experience of societal backlash from the ton. Orphaned as a teenager and sent to live with her endearing yet notoriously eccentric scientist uncle, her reputation was not off to an easy start. An indecent incident with a boy during this trying time had her feel as if she were ruined forever-all as a teenager! Therefore, she decides to make something positive out of her life and become an Everton Lady. Ladies of the Everton Domestic Society dedicate their lives to accomplish certain tasks requested by their clients. Accompanied by a chaperone, they are to be professional at all times and get the task done efficiently. They certainly are not to be distracted. They certainly are not to be flirtatious. And they most certainly are not to fall in love with their client. But who can truly stand in the way of true love? I enjoyed this book and it was very easy to become immersed in this environment. I enjoyed the symbolism of chess as the power play between king and queen, yet also used as a symbol of Millicent and Preston as being treated as equal players. Furthermore, I enjoyed the dog and the kitten that were rescued and became family pets. They were my favorite characters in the book as they were not only adorable characters but also another way that Preston and Millicent bonded. This is the second book in the Everton Domestic Society, however, it can be read as a standalone. This book also references characters from the Forever Brides series but can be read even if the reader has not read those series as the author provides a brief background on each of those characters. On the other hand, I had read the Forever Brides series and was very happy to see those characters added into this series as it was like catching up with old friends! I would recommend this book for adult readers who enjoy regency romances, romances that defy society standards, and romances that develop after adversity. I would also recommend this book for dog, cat, and chess lovers. However, I would not recommend this book for those who may be offended or triggered by fire, parental death, manipulation, and explicitly sexual scenarios. Please note: an electronic ARC of this book was generously provided by the publisher via NetGalley in exchange for an honest review-thanks! Just let me say upfront, I loved this story and also the first book in the series "A Lady's Honor" but each can be read as a standalone. Millicent Edgebrook is done with the marriage mart. Every time she gets to know a gentleman she finds he is perfect for one of her friends! Yes she seems to be a matchmaker but cannot find her own match! She decides to step out and be independent so she applies for a job at the Everton Domestic Society and is hired on the spot. Her first case is to find a bride for Preston Knowles, Duke of Middleton who has already had some problems himself. Millie and Preston were both such lovable characters. As she worked with him an attraction arose which each of them tried to resist. There are such wonderful secondary characters that also add so much to this tale. Will these two find love together or are they fated for others? I look forward to every book by this author and I am never disappointed. This held all the elements of humor, intrigue and of course love. Trust me, you will love it! I read this through NetGallery.